Sensitive teeth plague over half of the population of the United States. Sensitive teeth can interrupt and ruin a perfectly good hot cup of coffee, a delicious bowl of ice cream, or even make rinsing your mouth out after you brush your teeth an unpleasant experience. 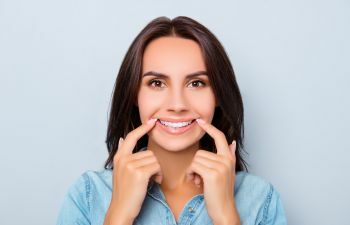 It is important that you have your sensitive teeth evaluated by your dentist because sensitive teeth are typically indicators that something is not right inside your mouth. Sensitive teeth are most commonly caused by the exposure of the dentin layer of the teeth. This layer of the teeth has thousands of tiny tubes that lead directly to the root of the teeth, causing extreme zaps pain to occur whenever cold or hot temperatures, or even sweet or sour tastes, hit the roots. Many people try to ignore their sensitive teeth by chewing only on one side of the mouth or simply avoiding certain foods or beverages. While this may provide temporary relief, it will not get to the root of the issue. Sensitive teeth are an indicator that something is wrong with your oral health. Whether it be a small amount of gum recession or something more serious, your dentist needs to evaluate your mouth to find the problem. If gum recession is the issue, changing the way you brush your teeth, replacing your toothbrush with a soft bristled toothbrush, and using a desensitizing tooth paste are often all that are needed. For more serious gum recession, a white filling can sometimes be placed at the exposed area to protect the tooth. However, there are other causes of sensitive teeth that are more serious and require intervention. A cracked tooth, an infected tooth, or gum disease must be treated as quickly as possible. These issues will never resolve on their own, and they will only become worse the longer you ignore them. Dental crowns, root canals, and other treatments can provide effective solutions that will restore your teeth and prevent further damage. At Gold Hill Dentistry, we are here for all of your dental care needs. If you are plagued by sensitive teeth, please contact our practice right away. You do not have to suffer until your next appointment. In fact, if your next appointment is more than a week away, you could be compromising your oral health by putting off evaluation. We will evaluate your mouth to find the cause of your sensitive teeth, and we will make the most appropriate treatment recommendation. We care about your smile. Call today.